It was first mentioned in an English book of herbs as a remedy to calm the bladder. In terms of Chinese Traditional Medicine, it has its whole effect on the Lower Jiao (in the Triple Burner system). Uva Ursi has a cooling, drying effect on moist and hot pathological conditions. Bearberries contain high levels of arbutin, which mainly effects the disinfection and activation of mucous membranes in the urinary system. Effective functioning, however, requires alkaline urine, for which a vegetarian diet and/or the consumption of alkaline food supplements is helpful. Please note: urine may become brown in colour subsequent to consumption; this will disappear again after a few days. As well as its health-promoting characteristics, magical properties are also attributed to bearberries. 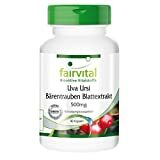 Uve Ursi Bearberry Leaf Extract 500mg: with properties which calm the urinary system. Bearberries contain high levels of arbutin, which mainly affects the disinfection and activation of mucous membranes in the urinary system. Effective functioning, however, requires alkaline urine, for which a vegetarian diet and/or the consumption of alkaline food supplements is helpful. three capsules daily spread across meals and with plenty of water. Tip: Combine with an alkaline pH diet/supplement to optimise the effect.